Saskatchewan Premier Brad Wall and ten U.S. governors sent a letter Thursday to President Barack Obama - on the eve of his inauguration - urging him to approve the Keystone XL pipeline project that would carry oilsands crude from northern Alberta to the Gulf Coast of Texas. Canadian Natural Resources Minister Joe Oliver responded to the Saskatchewan letter by reiterating the federal government's support for the project. "As Canada's largest energy union, CEP has always believed strongly that the climate crisis must be addressed in the most pressing terms," said Dave Coles, president of the Communications, Energy and Paperworkers Union of Canada. "t is why we oppose export pipelines such as Keystone XL that sell off our oil resources and kill jobs in the process." CEP believes it is necessary to transition away from fossil energies by reducing emissions and investing in green energies while ensuring a just transition for energy workers and their communities. The Pembina Institute also argues that emissions will go up as direct result of the TransCanada Keystone Pipeline. Its new report disputes the U.S. State Department's original conclusion that if the Keystone weren't built, the oilsands would ramp up anyway. "The last EIS (Environmental Impact Statement) said there would be no increase in climate emissions, because other transportation options will simply move ahead. That's not true. 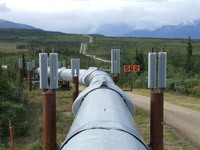 The Keystone XL is the biggest and most imminent pipeline on the table," said Nathan Lemphers from the Pembina Institute.